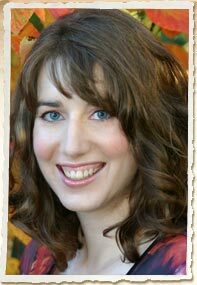 Hillary Manton Lodge graduated from the University of Oregon's School of Journalism and Communications in 2005. Her debut novel, Plain Jayne, will be released in winter 2010, with an additional title releasing in 2010. Between graduation and publication, Hillary interned for Northwest Palate Magazine in Portland, Oregon, and maintained a small photography business. She is also actively involved with Oregon Christian Writers. Hillary's books are hallmarked by her signature humor, quick-witted dialogue, and vivid characters. Her favorite themes to write about are healing and redemption. We’ve just returned from two weeks on the East Coast and all I can say is – wow! In two weeks, we visited or drove through a total of nine states, spending most of our time in Vermont, Washington D.C, Virginia, North Carolina, and South Carolina. We’ve faced 94-degree weather and thundershowers, long lines, heavy traffic, a chirping GPS, really good pizza, really cranky innkeepers (not ours, thankfully! ), clam chowder, pomp, circumstance, and big giant robots. And no, I’m not kidding about the big giant robots. My favorite part? 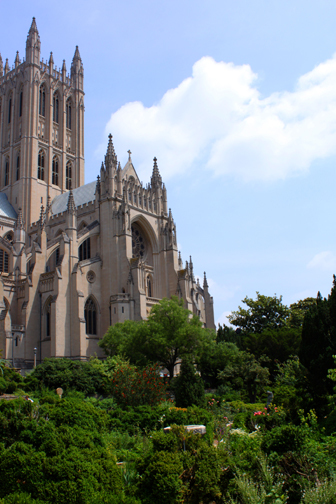 Visiting the National Cathedral (above). I took 174 photos there – and about 1,000 for the entire trip. I think I’ll be sorting through photos for a while. They know ice cream in North Carolina. 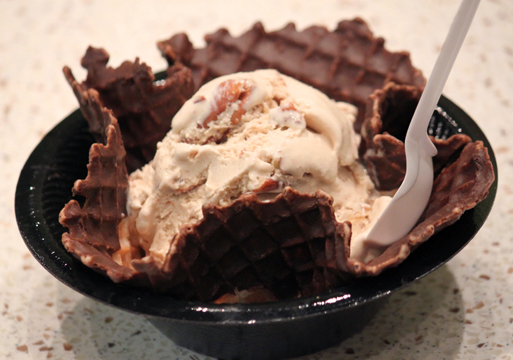 It’s the lovechild of the bowl and the waffle cone – the waffle bowl. I love the idea. Tricky to eat, but sometimes that’s the way conceptual art works. The best news? Simply Sara is done. I know I said she was done before, at least I think I did. But now she’s really done, going to print done, completed acknowledgements and final edits done. I’m a little delighted. And VERY excited thinking ahead to the next book – I’ll keep you posted on that! So the big giant robots? Well…I don’t have pictures. 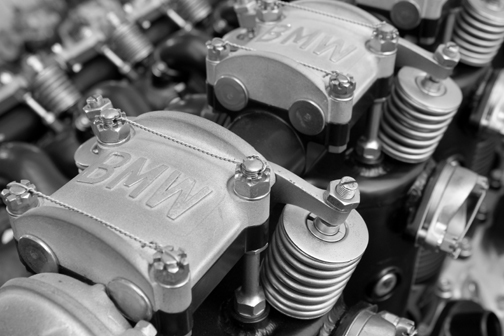 They confiscated my camera at the BMW factory in Spartanburg, SC. But they were big, and giant, and they threw sparks when they welded, and I won’t ever, ever forget them. Thanks again for all of your entries for the Simpy Sara Baking Contest! They were tons of fun to look through, and I absolutely love Rhonda’s winning recipe – I can’t wait for you to see how it works in the book! Q: Will you do the impossible and describe yourself in a paragraph? A: I write generation-next contemporary fiction. My books usually center on normal people learning to live, laugh, heal, and trying to understand the concept of God in a crazy world. I’m married to a wonderful engineer who keeps me from losing my mind (when you write fiction, this is big). I have too many books. I love British humor, bright colors, German chocolate, crossword puzzles, lipstick, cupcakes, cherry blossoms, and notepads with magnets on the back. Q: When did you first discover that you loved to write? A: I don’t know that I ever had a particular moment of discovery–I’ve always written and told stories. My mom’s saved my earliest attempts. They were illustrated. Finding out that I was good at it–that was big. I was 14 or 15, and at my first writers’ conference. I showed my manuscript to author Bonnie Leon, who told me it was “publishable.” That put everything into a very different perspective. Writing wasn’t just that thing I did in my free time. It could be a career. Q: What are some of your hobbies/interests? A: I’m into a lot of things, but I think most writers are. I love making stuff–knitting, cooking, photography. I grew up in a very artsy family with a lot of music and a lot of art. While I grew up on strictly classical music (some jazz later on), I’ve really gotten into indie-pop in the last couple years. While researching for another book project years ago, I discovered a love for film. We also finally bought me a motorcycle helmet and jacket, so I’ve been riding with Danny lately. I do have my endorsement, so maybe soon I’ll start riding on my own again! Q: What’s the best vacation you’ve ever taken? Or the dream vacation that you’d like to take? A: Danny and I went to Banff after my brother’s wedding last year. It was amazing. I loved it. There were mountains enough to keep Danny happy, and there were hot showers (Okay, mostly. The water was kinda weird), good food, and cute shops enough to keep me happy. Q: Tell us something funny or random about yourself that not everyone knows about you. Download the first chapter of Plain Jayne! 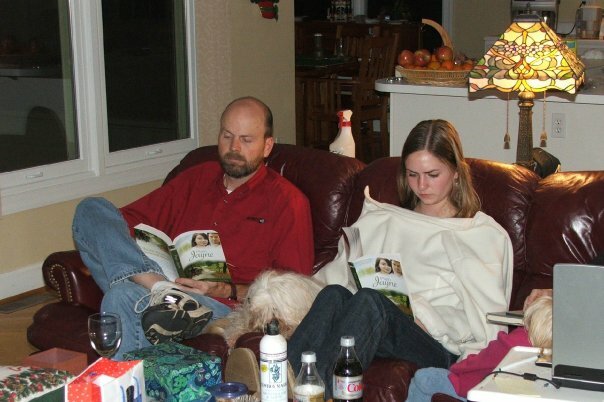 My uncle and cousin in North Carolina, reading the copies I sent for Christmas. If you’d like a preview of Plain Jayne, click here. The link will take you to the Harvest House site, where you can also find book group discussion questions. Above, note my favorite picture of the book – I love their faces! Believe me when I say the book really is funny. And yes, those are dogs by my cousin (in case you were wondering).